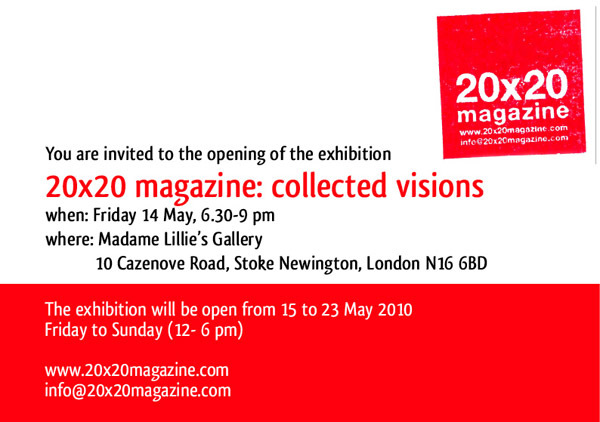 We are delighted to announce the opening of the exhibition 20×20magazine: collected visionson May 14th2010 at Madame Lillie’s Gallery, London.The show brings together works by 11 international artists featured in the first three issues of the independent publication 20×20 magazine. Through photography, illustration and drawing the exhibition reflects the concept and themes developed by the magazine and stands as a visual compendium to the written works published so far. Quirky drawings by Sarai Vardi and Greig Burgoyne, the offbeat style of Reena Makwana and Tristan Stevens are all juxtaposed with the analytical view of art and architecture conveyed in the photo-montages by Maaike Stevens and Philip John Jones.Aaron McElroy and Joanna Zylinska use photography to investigate human condition and interaction, while Helen Nodding, Olivia Bliss and María Kjartansdóttir cast an enchanted look over nature through meticulous drawings of organic forms and close-up photography. Founded in 2008, 20×20 magazine is the creation of Francesca Ricci and Giovanna Paternò, whose vision was to publish a square platform for writings, visuals and cross-bred projects. 20×20 magazine has participated in a number of major arts events, including the recent CCA Book Fair (Centre for Contemporary Arts, Glasgow, 2009), Publish and Be Damned (2008 & 2009), Glasgow International Artists’ Bookfair (2010), WildeBoekenMarkt (Rotterdam, 2010) and By Leaves We Live (The Scottish Poetry Library, Edinburgh, 2009). The Agency is proud to be presenting an exhibition of collaborative curatorial and critical practice. The Agency gallery will be given over as a pop-up space to norn, The Pigeon Wing and microPerformance, artists, curators and collective art initiatives, which have established identities in their own right. agency is an exhibition of collaborative curatorial and critical practice as collective, as gallery, as event, as writing, performed. The Pigeon Wing presents 2009 Retrospective as an open discourse investigating differences and similarities between the project space and the gallery. Within a literal reincarnation of shows held at The Pigeon Wing in 2009, agency presents a new platform for the artists involved to re-visit their motives and re-enact their works, to fit within the walls of The Agency. Artists will include Joanne Smithers, Tim Adams, Alastair T. Willey, Amy Hye Jung Shin, Gareth Lloyd, Frederick Fuller, Harriet Piper, Isobel Shirley, Katy Keefe, Nikos Mantzios, Theo Turpin, Xavier Jimenez, Scott Cowen, Matthew Verdon, JL Murtaugh, Paul Cowen, Annabel Tilley, Francesca Ricci and Jack Bishop. part of a transatlantic project by Isobel Shirley. Selected from an open call for submissions, the Art/ Value/ Currency collection consists of 27 emerging UK based artists, with all work fitting the dimensions of 4” x 6”, resulting in a diverse selection of art from throughout the country. Part One: The 31 works are exhibited at The Pigeon Wing, together with an open discussion of the project and the works involved. Part Two: The collection will be taken to New York where Shirley will visit local artists, galleries, curators and collectors to showcase this collection of British art. During these meetings the works will be offered in exchange for another artwork of the same uniform size to take its place. These meetings and exchanges will be documented through the Art/ Value/ Currency’s online space hosted by TheBunkerGallery. Part Three: Once all the artworks have been exchanged for new work, the collection will return to London and be re-exhibited at The Pigeon Wing. These new works will then be given to the original set of artists to complete the swap. Art/ Value/ Currencyexplores the intertwining roles of trade, value systems and networking within the art world, highlighting the importance of creating exposure for artists and their working practice. Documentation of the process and its outcomes will be released through This Is Publishing. This participatory performance is a low-tech attempt at personal intervention in a global system. The Pigeon Wing will form the gondola of a small, hot air blimp that aims to rise low into the sky, with little to no impact on the many international flight paths overhead. Followed by drinks, refreshments, further performances and discussion of the Art/ Value/ Currency collection.